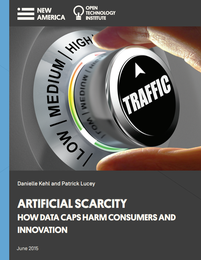 Below is the executive summary for "Artificial Scarcity: How Data Caps Harm Consumers and Innovation." Read the full paper here. In this paper, we examine the growth and impact of usage-based pricing and data caps on wired and mobile broadband services in the United States. We analyze the financial incentive that Internet service providers (ISPs) have to implement these usage limits and discuss research that demonstrates how these policies affect consumer behavior. In particular, we explain how data caps can make it harder for consumers to make informed choices; decrease the adoption and use of existing and new online services; and undermine online security. It is also increasingly clear that data caps have a disproportionate impact on low-income and minority populations as well as groups like telecommuters and students. In the conclusion, we urge the Federal Communications Commission (FCC), particularly as the new Open Internet Order goes into effect, to open up a serious inquiry into whether data caps are an acceptable business practice.